70PU - Heavy Duty. These bags do not tear or split. 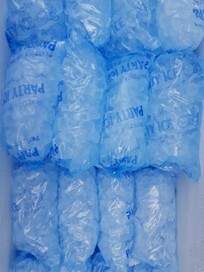 Perfect if you are looking to bag your own ice and sell it. Buy 50 Meters of twisty wire ties from your your $2 shop or TM. I sell a lot of these to Liquor stores, supermarkets, dairies and fishing shops who make and bag there own ice for higher profits. Please also see month other listings for larger bags and Party Ice making machines from 15kg/24hr to 1.5 tons/24hr. Pick up available in Maungaturoto.